Innovation Labs have become popular for enterprises to manage innovation. There are a large number of Innovation Labs – with the intent of enabling companies to explore new technologies, ideas, opportunities, business models, products / services, etc. This is important for the enterprise to have a future, attract talent, increase relevance and revenue, create significant wealth, etc. – if you can monetize value creation and manage the risks associated with change. For those enterprises to move forward it’s about successfully doing Incremental, Sustainable and Disruptive Innovation. In conjunction with this, there is a need to develop the Innovation Mindset where finding the new billion $ products and services is about appreciating the law of large numbers, learning quickly, failing fast, scaling, becoming a more entrepreneurial / opportunistic organization, being agile, sophisticated in metrics (hard and soft). As well, it’s crucial enterprise leadership have a vision of the future and how to position their organization for success – with the ability to effectively articulate it and get buy from all stakeholders. Innovation Labs have the potential to expedite developing these capabilities and be the launch pad for new products and services to drive change and improve business outcomes. Since this is crucial for the enterprise to have a future is why Innovation is strategically important in its many forms – Innovation Labs, internal company initiatives, with Partners, with Startups, companies in the Innovation ecosystem, etc. Innovation Labs frequently create challenges. One part of the problem is what Steve Blank calls ” Innovation Theater ” – when teams in innovation labs use lean startup tools without really understanding how they work. They take the canvases, sticky notes, whiteboards and bean bags, and they start thinking that they are all set for doing innovation. The teams then focus their attention on making cool products, without thinking about the business models that underlie those products. This often leads to failure and the unjustified sense that lean startup doesn’t work as a method for innovation. But there is an even deeper problem with innovation labs based on what Eric Ries calls ” The Problem of Success “. This challenge causes the most frustration among people who work inside innovation labs – who are hardworking diligent people that understand how to apply lean startup methods and tools to produce results. They often succeed in creating great products with good business models. However, when they are ready to take these products to scale they face resistance within the enterprise. This is very frustrating – for the Innovators as well as within the enterprise. In conjunction with this, Innovators are puzzled why corporate leaders fund an innovation lab and then refuse to scale the products that are created there. Why waste time and resources in this way ? From the enterprise perspective, especially with people running current production systems and have a lot to do to support Customers and address a myriad of operational matters. These folks, have huge comfort with current products, services, processes, etc. and find it challenging to change – either to get outside their comfort zone, because the new products or services are different or they don’t immediately have a huge impact on the business, require learning new things, etc. As well, unless enterprise leadership has the vision, is very strategic in their thinking, patient, is determined to move to a new business model, recognizes the importance of digital platforms and delivering a great User experience, and can manage the risk / reward – benefitting from innovation will be a huge challenge. And when coupled with a status quo or risk averse political environment, many enterprises are not realizing anywhere near the benefits from Innovation Labs they were expecting ! The myth of the Innovation Lab is based on the notion that Enterprise Executives who funded the lab understand its purpose and support innovation. The innovators working inside the lab assume that their colleagues in the enterprise understand and respect them. This is frequently not the case – especially over time if no impressive innovations have meaningfully improved business outcomes. As a result, there is a disconnect. 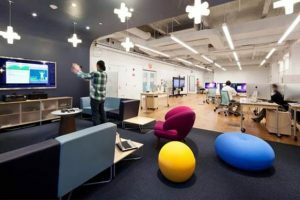 When traced back, what has really occurred is that the opening of the innovation lab itself often represents innovation theater – played out at the leadership level within the enterprise and often in the innovation lab – but not shared by those doing the work in the enterprise or the innovation lab ! It is very rare that you find a leadership team that has thought through the implications of opening the lab. The first symptom of this is the lack of a clear innovation strategy. A lot of corporate leaders have not taken the time to consider where the world is going and how this will impact their business in the future. And for those who have thought about the future, only a few have developed a clear point of view about how their company will use innovation to respond. When they set up the innovation lab, they are simply hoping that something that will save the company will emerge from there. But without clear strategic goals, leaders often fail to recognize a good product that may be the future of their company when they see it. This is made worse if the new product from the lab threatens to cannibalize a successful core product in the enterprise. The instinct to protect those traditional revenues will trump anything else. A second symptom is the lack of a clear framework for managing innovation. Most companies do not have a method for tracking and measuring innovation success. Furthermore, they do not have a clear framework for taking products from the lab, back into the main company or spinning them out as standalone divisions. This means that the leadership team is unprepared for managing the challenge of success when it happens. For these leaders innovation success may not be a good problem to have after all. What we are learning is that those who really understand successful innovation requires them to manage their stakeholders, effectively set expectations, build strong relationships, and deliver results to move the business forward. The need for stakeholder management is most clear to people that are working on an innovation project within the enterprise. In that situation, they know they their product will not succeed without support from key stakeholders within the enterprise. Therefore, it’s critically important for all stakeholders to engage and effectively collaborate in the context of innovation and enterprise processes and outcomes. While easy to manage with a successful new initiative, given the frequent disappointments from innovation, leveraging these relationships and lessons learned are essential to increase the rewards from innovation. For this reason, the most successful innovators know that they have to manage their relationships with the stakeholders in the enterprise, expand comfort zones, and create value – to get buy-in and support from leaders and key stakeholders. Based on the article by Tendayi Viki, the author of The Corporate Startup, an award winning book on how large companies can build their internal ecosystems to innovate for the future while running their core business.